We are pleased to announce that a new item “Snowflakes” will be available at our retail and online shop from October 31, 2018. 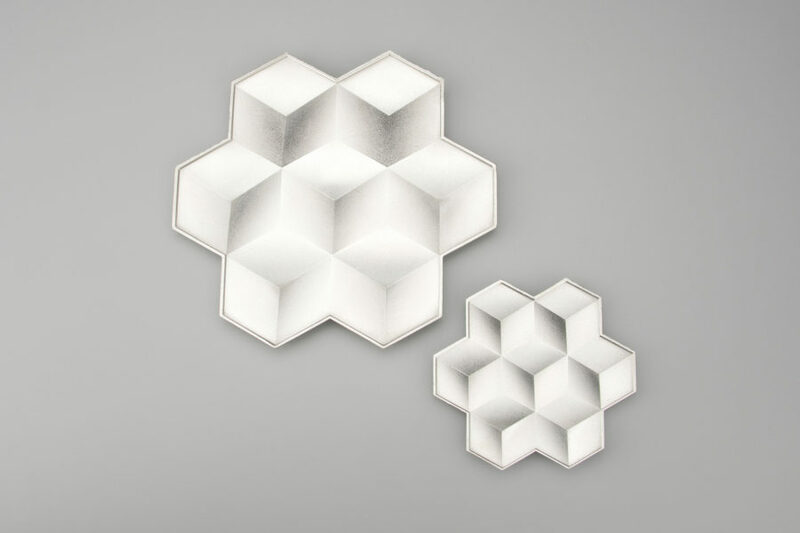 This 100 % tin plate is designed by the pattern which is formed by placing one kind of geometric shape. 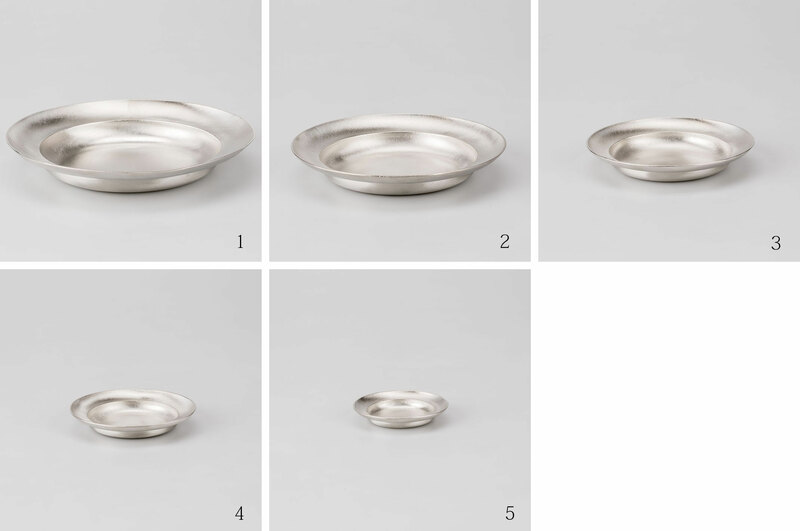 Seven small dimples make them ideal for serving nuts, olives, candy or accessories; their fluctuate pattern adds a bit of cheer to any tabletop. 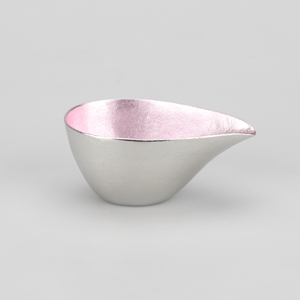 This item is designed by a Taiwanese designer Ching-Ke Lin and manufactured by Nousaku under a joint project between Toyama Design Center and Taiwan Design Center. We are pleased to announce that following dishes are available at FACTORY SHOP and online shop as the third release of “so-en” series. 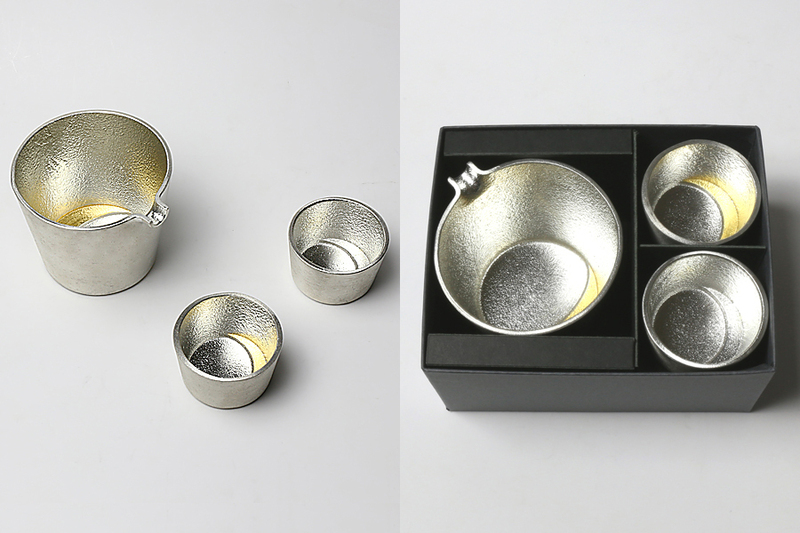 “so-en” series shares not only the shape but also the brand itself, making a common shape “double circle” item of different materials (tin, glass and ceramic). We have five sizes of the dishes, from the largest one suitable for main dish to the smallest one suitable for appetizer. We hope you to enjoy the difference of the appearance and property of each material. *will be available at the other NOUSAKU shops from early July. We are pleased to announce that following tumbler and beer cup will be available at FACTORY SHOP and online shop as the second release of “so-en” series. *will be available at the other NOUSAKU shops from late-May. We are pleased to announce that “so-en” series has been newly released and following three items are available at our retail and online shop from February 14, 2018. “so-en” is a brand under the concept making a common shape “double circle” item of different materials. For the first release, glass ones by SUGAHARA GLASSWORKS INC. and ceramic ones by NAGAE co., ltd. were made as well as metal ones by NOUSAKU. Japanese word of circle “En” also has the meaning of “chance” or “luck” in Japan. This series was designed under our wish for you to have many chances and lucks. All comes in so-en brand package. We are pleased to announce that the limited items for this spring will be available at our retail and online shops from February 21st, 2018. 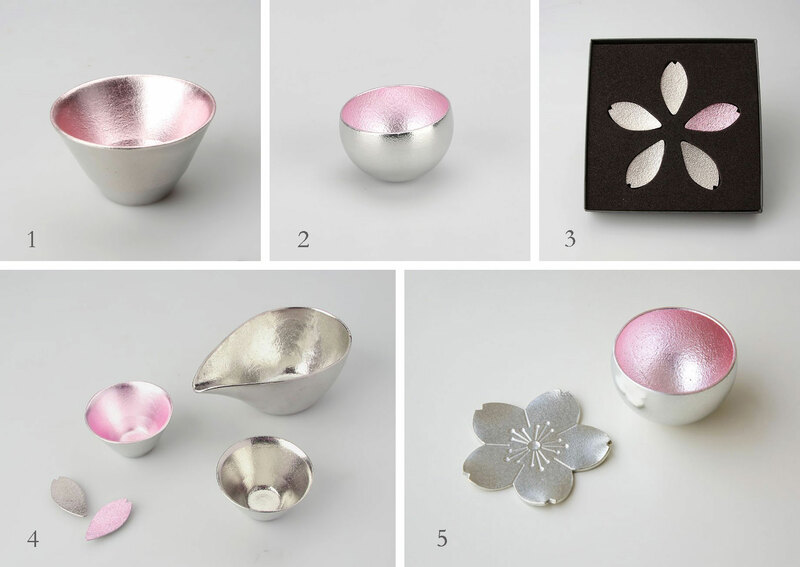 These items are in the motif of cherry blossom and best for your spring gift. Kindly note that the number of the items is limited. Please ask each shop for the availability. We wish you a happy holiday season and joyful New Year 2018. Last year was memorial year for us since our new office and foundry was opened. We sincerely appreciate your support and encouragement over the past years. We will keep making efforts and hope to receive your continued patronage in this year. Thank you for your continuous support and patronage. Celebrating the new year, customers who make purchases over JPY 15,000 (incl. tax) will receive a NOUSAKU calendar currently sold from January 1st at our retail and online shops in Japan. Please note that the number of the special gifts is limited and only one per person. 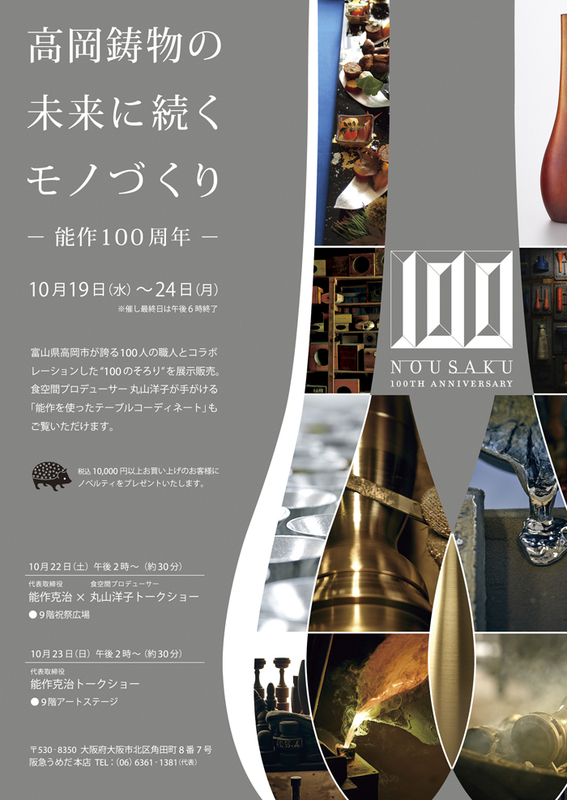 All of us at NOUSAKU look forward to your visit. We would like to announce that we will be close as below for winter holidays in Japan. For inquiries and orders received within the period, we will be back to you as soon as possible after our return to work. Celebrating the new year 2018, we will release lucky bags full of valuable items, not only popular tablewares but also limited items at FACTORY SHOP. We have two kinds of the bag, “Take” at JPY 10,800 and “Matsu” at JPY 21,600 (including tax). 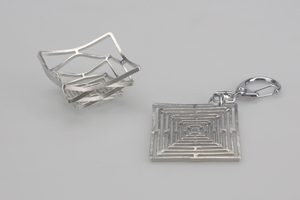 In addition, “Hatsuyume” at JPY 32,400 is also available only at Nihombashi Mitukoshi shop and Hankyu Umeda shop. These bags will be for sale at all our retail shops in Japan on the first opening day in the new year (refer to the following schedule). And advance orders are now available at our online shop and will be shipped after January 4th, 2018. The number of the bags is limited. Please do not miss this opportunity! For more details, please ask our staff at each shop. The first opening date of each shops is as below. We are pleased to announce that we made 2018 NOUSAKU calendar in response to our customers’ requests. This calendar shows you the working sceneries of our craftsmen. Only available at our retail and online shops in Japan. We are pleased to announce that the following limited items for new year are now available at our retail and online shops in Japan. Tin 100% chopsticks and sake cups which have each of Chinese characters “萬福無極 (manfuku-mukyoku)” written by Mr. Shogo Kuroda, a Japanese calligrapher in Takaoka-city. This word means “unlimited happiness” and used to wish happy life. 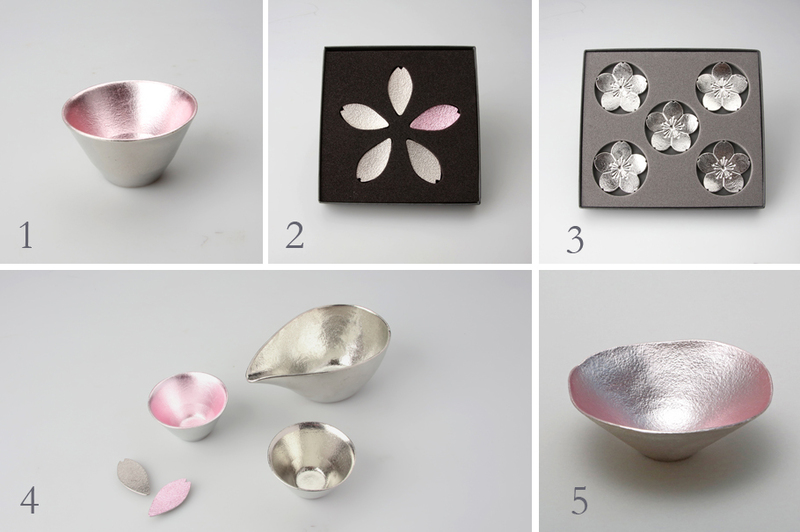 Taking after a fan-shaped lacquer plate by NOSAKU, lacquerwares shop in Kanazawa, we made tin fan-shaped plate. 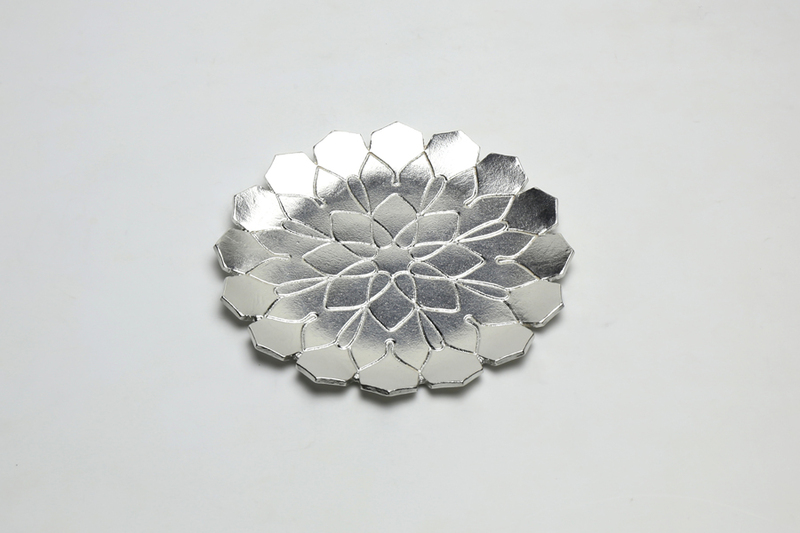 The sand texture made by casting enhances its beautiful form, which has been evolved in long history. Fan is said to have the meaning of “prosperity” in Japan since it widens toward the end when opened. The number of items is limited. Kindly ask each shop for the availability. We are pleased to announce that 100 % tin items collaborating with FINAL FANTASY, a popular roll-playing-game, have just released on December 1st, 2017 (only available in Japan). Celebrating the release of “DISSIDIA FINAL FANTASY NT” and 30th anniversary of “FINAL FANTASY”, this series was produced in collaboration with SQUARE ENIX CO., LTD. and LIVES Inc. to tell Japanese culture and crafts to the world. 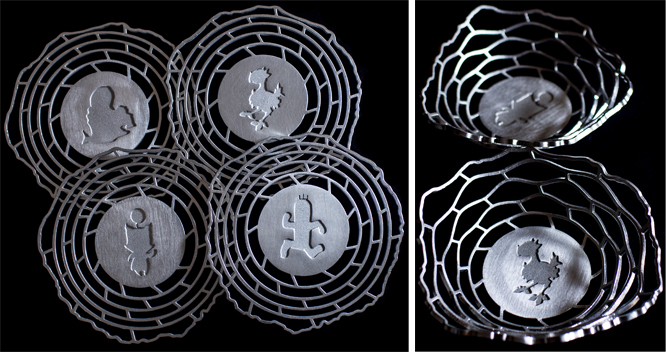 We would like many FF fans to have new surprise and enjoyment with our “bendable” item. As the first release, advance orders of the following items have been taken from December 1st, 2017. Please do not miss this opportunity! The latest item of our Oriental Zodiac series, Dog, will be priorly released on October 18, 2017 at our retail shops including Taipei Marriott Hotel shop, and online shop. 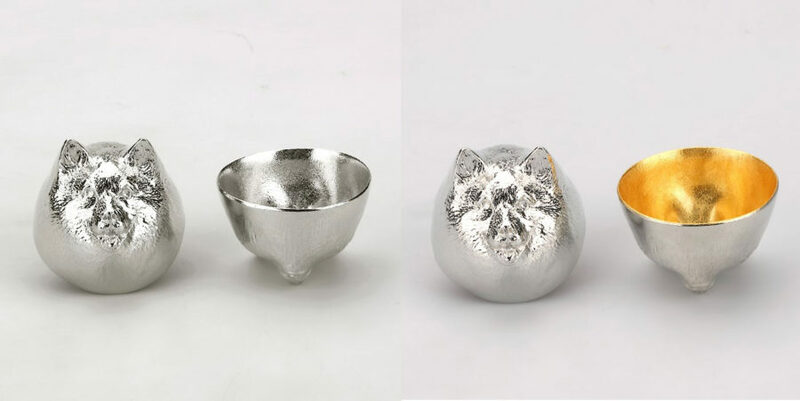 This sake cup series was launched in 2010, and the animal of 2018, dog is the 9th animal starting from Tiger. Dog has meanings of “safe delivery, safety, protection, loyalty and devotion” since it is faithful animal and has associated with humans from long ago. 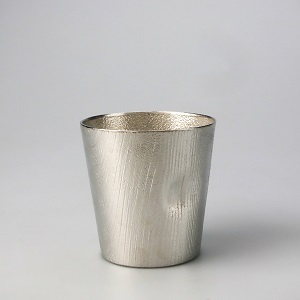 Although it is designed as a sake cup, you can also enjoy it as a table accessory or an interior object. Each animal comes in 2 types, 100% pure tin and with gold leaf applied inside. We are pleased to announce that the limited editions in this autumn will be exclusively available at our retail and online shops in Japan. From the old days in Japan, people has enjoyed waxing moon and admired the full moon in autumn season known as Tsukimi, a moon-viewing celebration, drinking sake and having good food. These limited items will surely enhance the enjoyment of Tsukimi. Please have pleasant times with your dearest in the long autumn evenings. We are pleased to announce that the limited edition: “Wind bell – the Milky Way” will be available at our retail and online shops in Japan from June 14th. “Tanabata” known as “The Star Festival” is celebrated in July, to commemorate the romantic story of two lovers represented by the stars Vega and Altair. According to a legend, the Milky Way separates these lovers, and they are allowed to across the Milky Way and meet each other only once a year on the evening of July 7th. Two separate slips are becoming one and it express the story of two lovers. Please enjoy the twinkle sound floating in the breeze while imaging the beautiful starlit sky. This is a limited supply item. Kindly contact each shop for the availability. 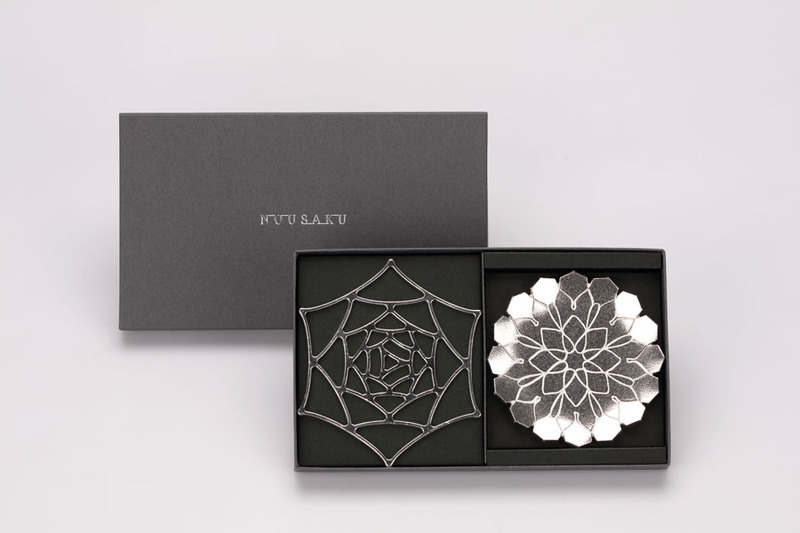 To celebrate Mother’s day, NOUSAKU has released a flower tray using a dahlia as a motif. Dahlia’s flower language is “thankfulness”. 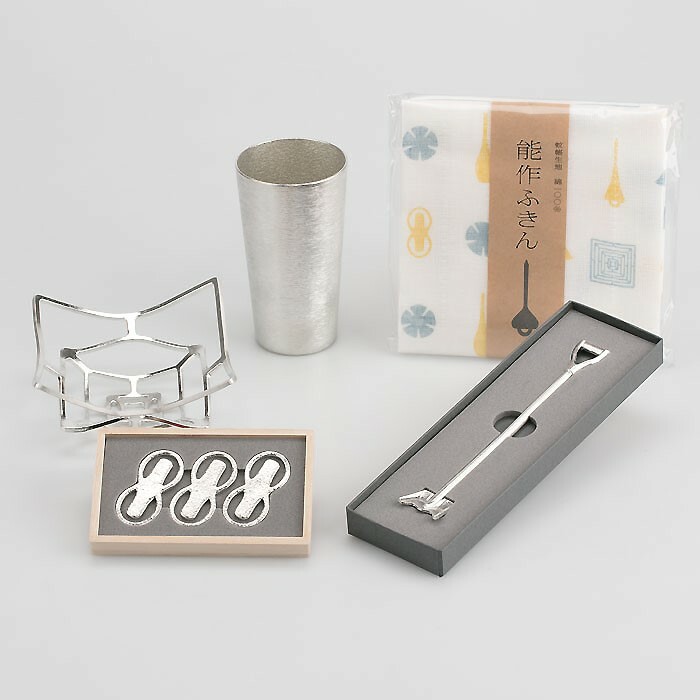 What do you think of expressing a gratitude message through NOUSAKU tinware? These limited items will be available only at NOUSAKU shops and online shop. We hope you will visit us soon. We are pleased to announce that our new item “Beer Cup – white birch pattern” will be on presale at our retail and online shops from April 12th. This item has a pattern on the side, imaging a white birch. 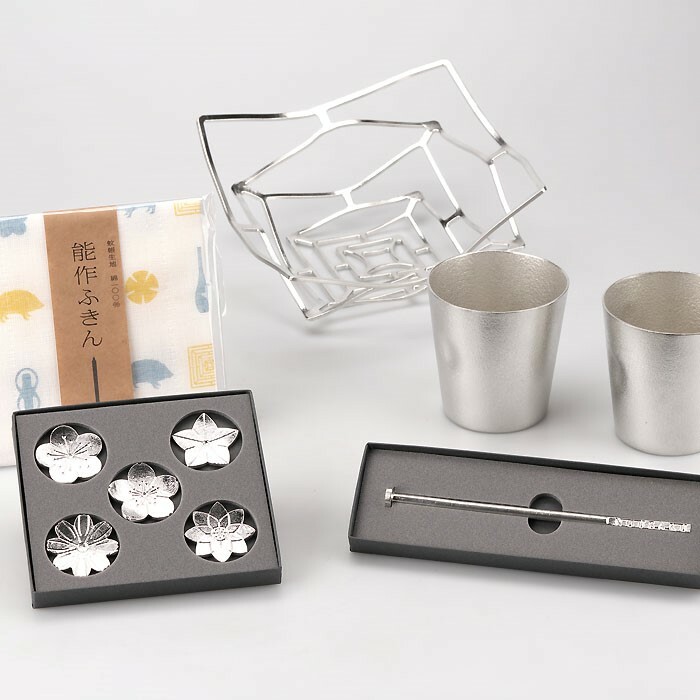 A Yezo Sika deer sleeve and coaster are in a set so that you can enjoy without bothered by water drops on the cup. 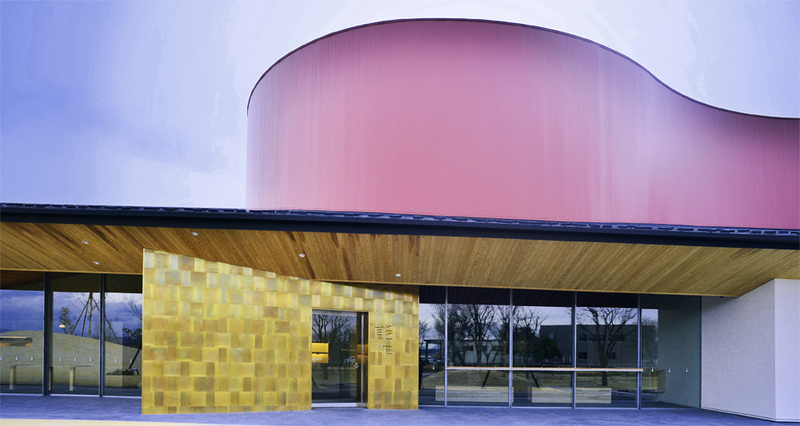 NOUSAKU collaborated with 24 KIRICO promoting Yezo Sika leather in Hokkaido. We hope you to enjoy the collaboration of Tin and Leather. 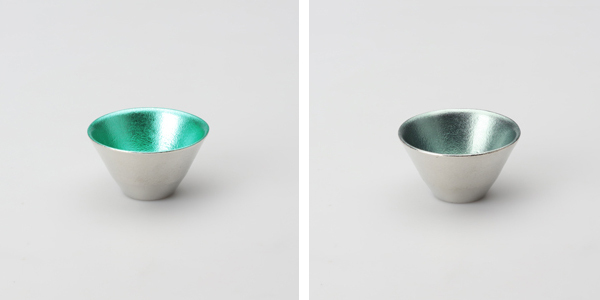 We are pleased to announce that the following 2 items; “Pitcher – TOKKURI“, and “Small Cup – CHOKO”, will be on presale at our retail and online shops from March 8th. It is designed for Soba soup but can be used for Sake as well. Putting “Pitcher – TOKKURI” in icy water just for 2-3 minutes, it can be chilled well with its high heat conductivity. We also offer a set of those 2 items in a beautiful wooden box which makes a perfect gift for any special occasions. *Already available at NOUSAKU shops in Matsuya Ginza Department Store and Hakata Hankyu Department Store. We are pleased to announce that the following 2 items will be on sale as the second series of this spring limited edition, from February 18th. With its lovely color, both the items will be a perfect gift in this season. *Only available at our retail and online shops. 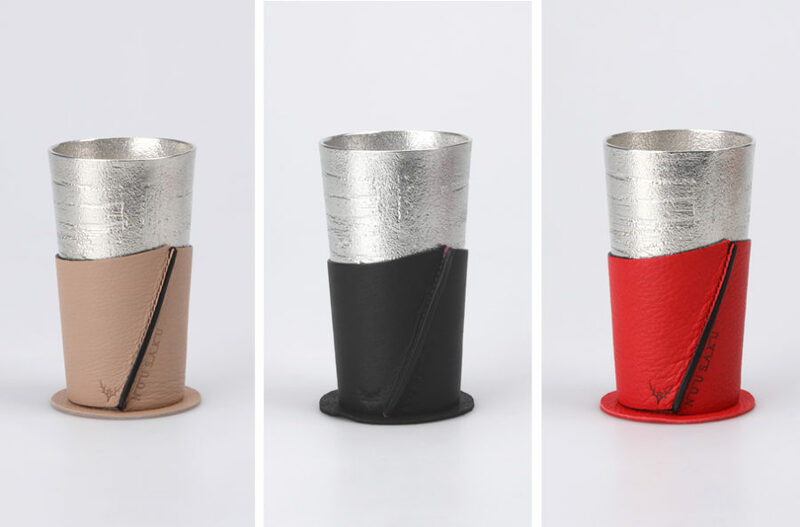 We are pleased to announce that the new item “Sake Pitcher – CHIRORI with hinged lid – S” will be on presale at our retail and online shops from Feb 8th. When you open the lid, you can enjoy the great aroma of sake as it is enclosed in a pitcher while heating. 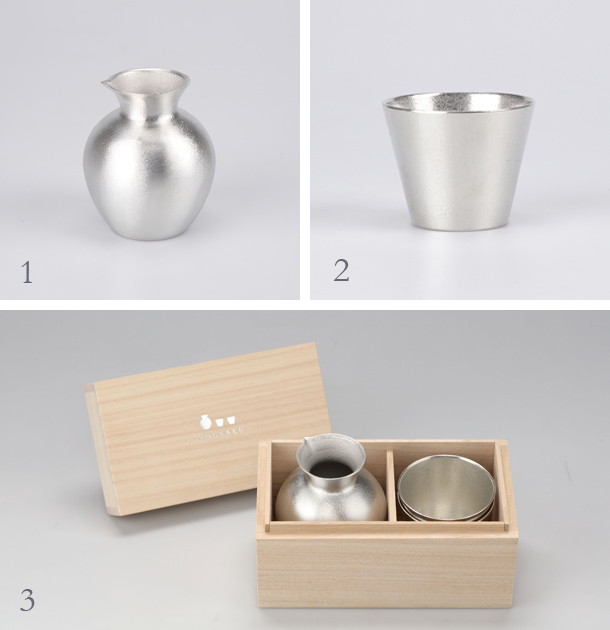 The high heat conductivity of tin enables you to quickly warm sake in hot water or even chill in icy water. On sale: February 8th (Wed) at our retail and online shops . We are pleased to announce that the following items in the motif of cherry blossom will be on sale at our retail and online shops. 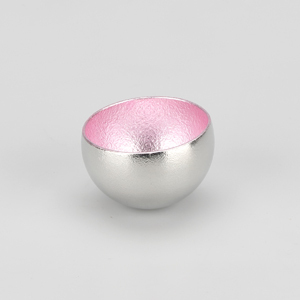 Some of our classic items will be available in a beautiful cherry blossom pink. Please don’t miss your chance to get the limited-supply items. On sale: Jan 28th (Sat) at our retail and online shops. Christmas and the New Year are around the corner, we would like to introduce the limited edition: “Champagne glass – S” which is available at our retail and online shops from this weekend. In response to many requests from customers, we developed this tin version of our regular Champagne glass which is applied gold leaf inside. 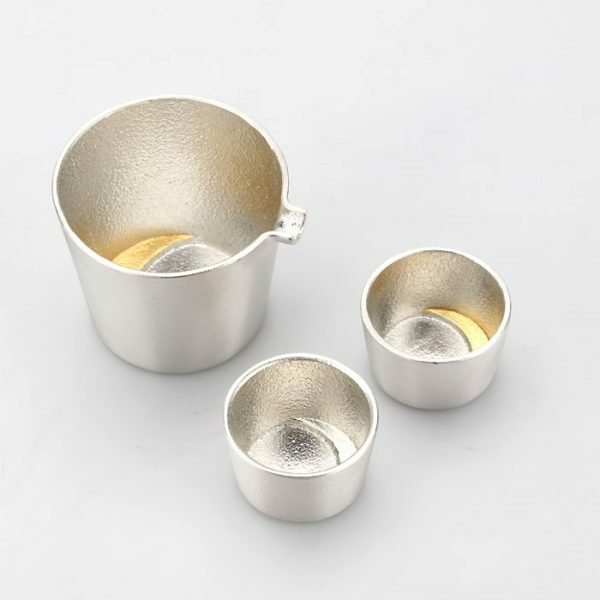 It has been believed that water in a tin container does not spoil and tin enhances the flavor of sake, this tin glass is perfect to enjoy the great properties of tin, especially for this party season. Celebrating the 100th anniversary, we have been carried out the “100 Sorori vases” project, featuring one of our best-selling flower vases, Sorori. In this project, 100 craftsmen based in Takaoka applied their special finishing to each Sorori vases so as to embody their craftsmanship and brilliant technique. 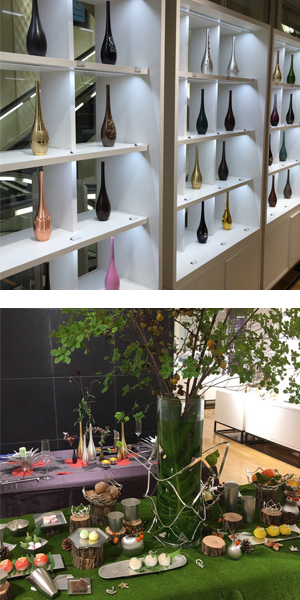 Introducing the background of the 100 vases, we are now holding the 2nd special exhibition at Hankyu Umeda, following Fukuoka Mitsukoshi. *We accept the order for each Sorori vase but please be noted that these are produced on order. During the period, we will introduce the elegant table setting using our items, arranged by Ms. Yoko Maruyama who is the specialist in table decoration. In addition, customers who purchase over JPY 10,000 at the shop will receive a special gift. *The gift is presented only to the first 100 arrivals and limited to one per customer. We will be preparing exclusive items such as sake cups and plates applied colored-silver leaf, and waiting for your visit during the special period. We are pleased to announce that the limited edition in this autumn: NAJIMI tumbler – “Japanese pampas grass” will be available at our retail and online shops in Japan. Different from casting surface, it is given a special vibration finishing to portray the glass blowing in the autumn wind. 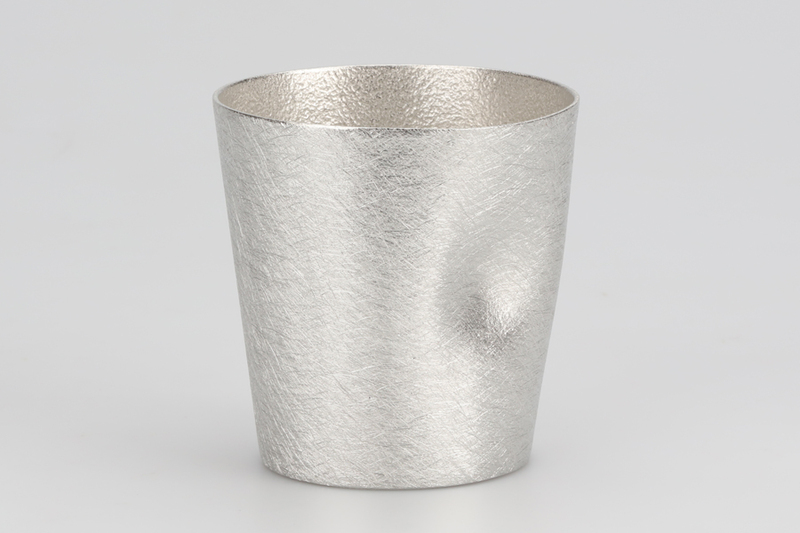 With its beautiful surface, the cup will be definitely add enjoyment to your drinks. On sales: September 22nd (Thu) * Only available at our retail and online shops in Japan. Following last year, we are pleased to announce that the Sake pitcher/ cup – moon set will be exclusively on sale at our retail and online shops in Japan, from August 20th (Sat). 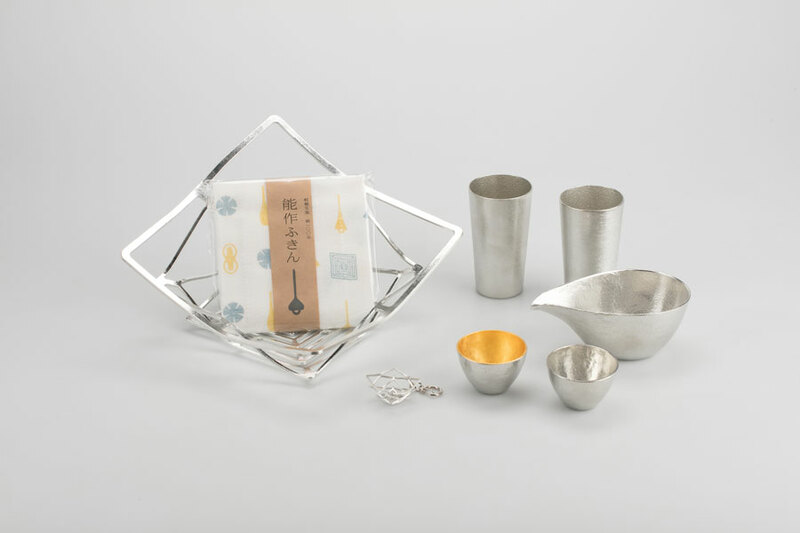 This moon-inspired items will surely enhance the enjoyment of Tsukimi. This is a limited supply set. Kindly contact each shop for the availability. We are pleased to announce that the sake cup KIKI – II will be available in new summer colors at our retail and online shops in Japan. Applied colored silver leaf, the special blue tones make a beautiful combination with the brightness of tin that makes us feel cooler and relaxed. 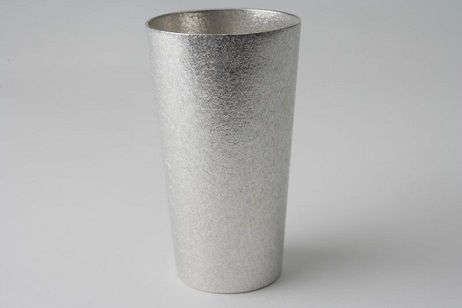 Because of the high heat conductivity of tin, we can enjoy the chilly drink with the cups as well. Please don’t miss your chance to get the limited-supply items and enjoy your summer time. Only available at our retail shops and online shops in Japan. We are happy to announce that the limited gift sets for this summer will be available at our retail and online shops in Japan. 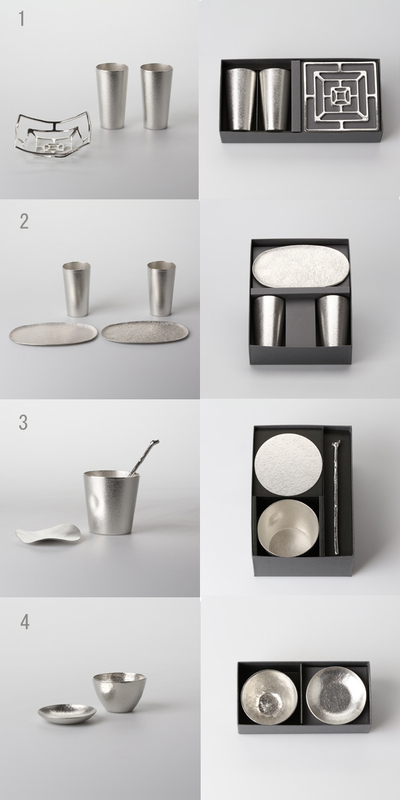 Each set makes a perfect gift for any occasion in this season as tin items give a cool feeling. Please don’t miss your chance to get the limited-supply set items. 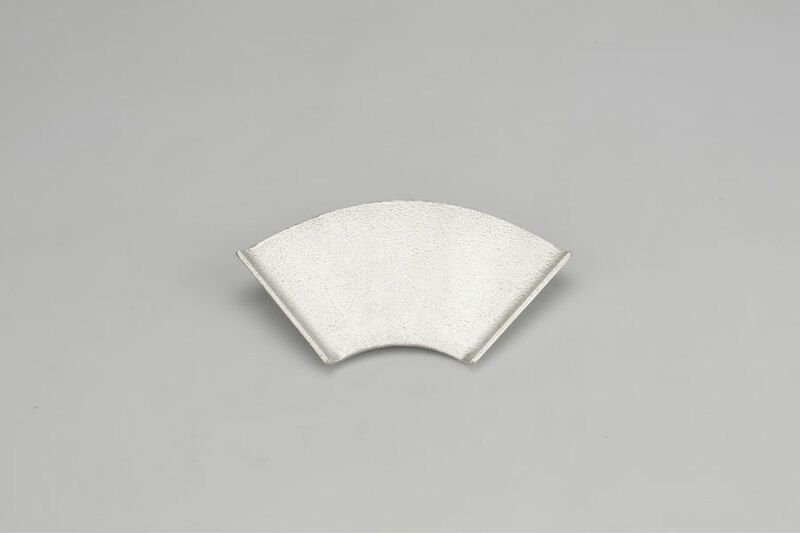 Customers who purchase over JPY 20,000 will receive the original charm in the motif of KAGO square – L. Casted and hand finished by our craftsmen, the miniature still enables us to enjoy the malleability, same as the original item. 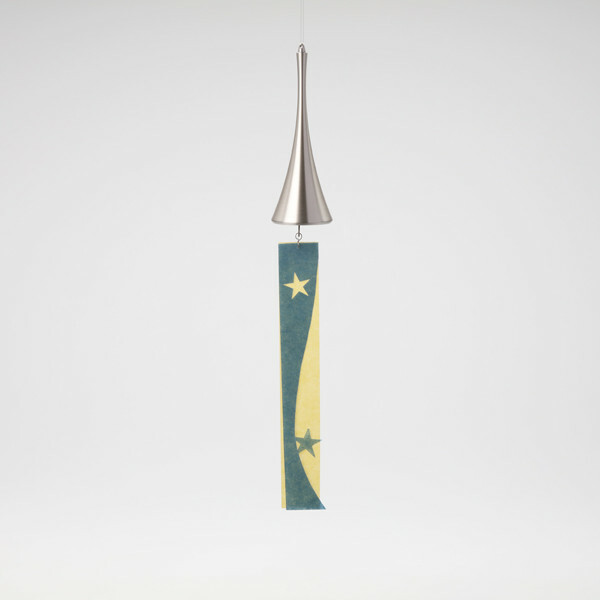 We are pleased to announce that the limited edition: “Wind bell – the Milky Way” will be available at our retail and online shops in Japan from June 15th. Price: JPY 5,724 (incl. tax) at our retail shops and online shops in Japan. 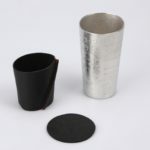 We are pleased to announce that “Udukuri” beer cup and NAJIMI tumbler in collaboration with Hacoa, a wooden goods brand in Fukui prefecture, will be exclusively on sale at our retail and online shops from June 1st (Wed). “Udukuri” is one of Japanese traditional wood craft techniques in which the wood surface is carved away with a metal brush, leaving only the hard wood grain. 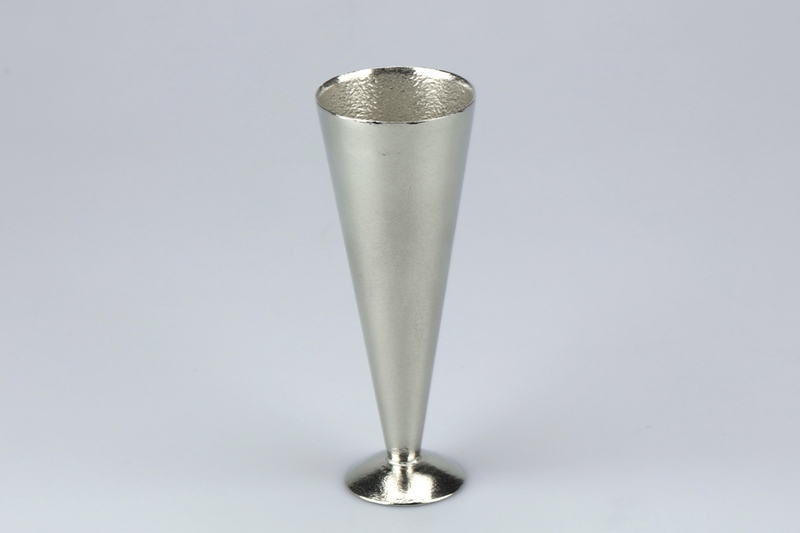 Achieved the fusion between traditional technique of wood crafting and metal casting, this beautiful tin item would be a perfect gift for any special occasions. On sale: June 1st (Wed) at our retail shops and online shops in Japan. 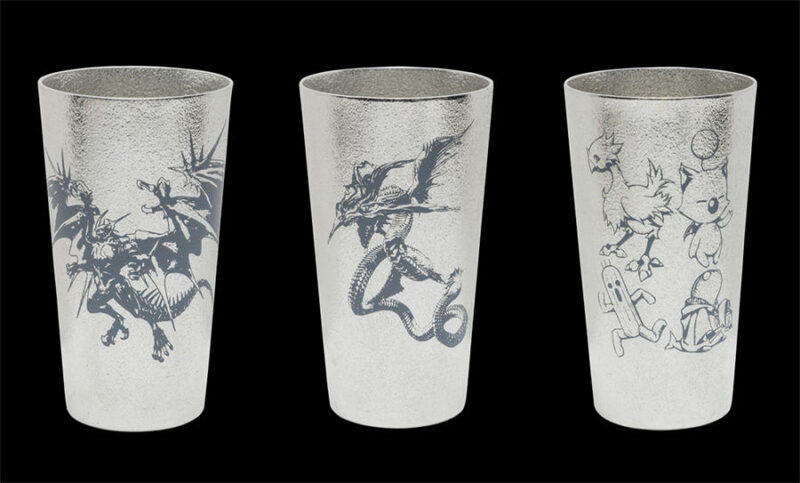 Following last year, we are pleased to announce that the limited edition: beer cup – “Cracked Ice” will be available at our retail and online shops in Japan from May 11th. Different from casting surface, it is given a special vibration finishing which enables us to enjoy the shimmering glitter texture. 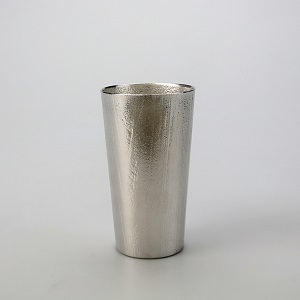 With its cool-looking surface, the cup will be definitely perfect for a summer gift. This is a limited supply item. Kindly contact each shop for more information.